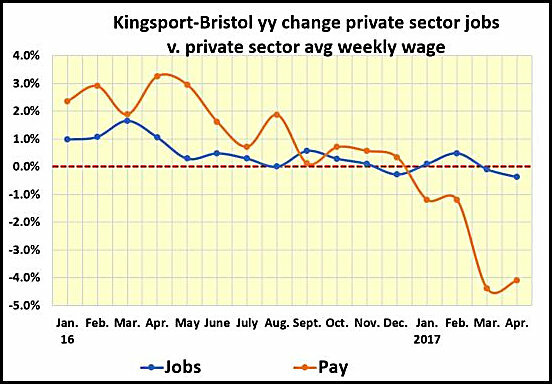 April’s private-sector wages saw a continuation of a Tri-cities trend that has become all too common. 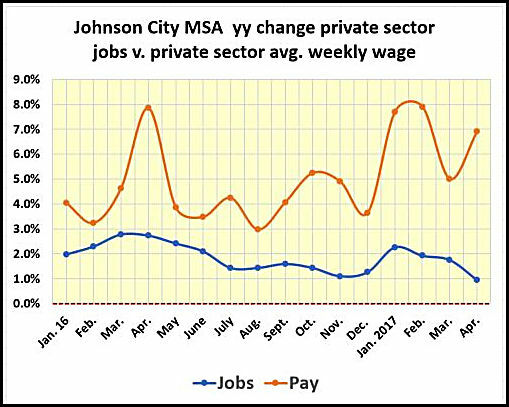 Workers in the Johnson City Metropolitan Statistical Area saw an increase while those in Kingsport-Bristol saw a decrease. The trend roughly follows the pattern of private sector job creation. Employers are still adding jobs, but the year-over-year growth rate is declining. April’s average weekly private-sector wage was $644.33, up 6.9% from April last year. It was the 21st straight month the weekly average has increased in the three-county region. Those improvements follow a four-year decline in the annual average. Last year’s annual average was (up 4.2%) was the first annual increase since 2011. Here’s how April’s average stacks up against some benchmarks and an annual wage basis. – $2,600 higher than the 2016 annual average. – $10,209 higher than the median pay per job. – $6,196 lower than the median pay for a full-time male worker. – $4,749 more than the median pay for a full-time female worker. The private sector wage is lower than the MSA’s total average weekly wage, which is reported quarterly with a three-month lag by the Census Bureau. It’s lower due to the number of non-private sector jobs. Here’s what the total average wage looks like in the MSA’s three counties. April’s weekly average was $629.30, down 4.1% from April last year and the fourth straight month it has dropped below the same month of the previous year. The year-over-year wage growth rate has declined since February last year at dropped into negative territory the first of this year. At the same time, the year-over-year private sector job growth rate had been softening since March last year. I dipped below zero one month last year, regained minor growth for two months then dropped back to negative territory in March. There were 400 fewer private sector jobs in the MSA in April than April last year. – $996 a year below the 2016 annual average. – $6,621 higher than the annual median wage for workers. – $9,251 less than the median annual wage for a full-time male worker. – $1,199 more than the median annual wage for a full-time female worker. Both of the local metro areas are well below the state average weekly private-sector wage of $805 a week. Kingsport-Bristol had the lowest average in the state in April and Johnson City was the fourth lowest. In Northeast Tennessee, Knoxville had the highest April average ($929). That was also the highest in the state. Morristown’s average was $692 a week. It has to be pointed out that a contributing factor in the average wage decline in Kingsport-Bristol mirror’s the area’s rapidly aging demographic. A growing number of workers – and higher-level executives – are retiring. Some of their replacements come in at a lower wage, and some are not replaced as part of a trend toward a contracting labor force.